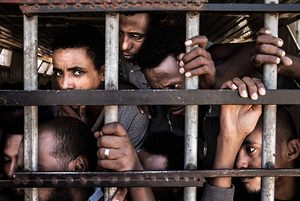 European Union Foreign and Defense Ministers approved an unprecedented deployment of naval force against Libya, on the unconscionable pretext of stopping desperate people fleeing war, starvation and mass death from entering Europe en masse across Mediterranean. The decision was approved today when the ministers met in Brussels. NATO Secretary General Jens Stoltenberg told reporters that NATO stands “ready to help if there is a request,” before the meeting began. EU Foreign Policy head Federica Mogherini said afterwards that the EU is going to rush to put this plan through by June, because the summer months are “high season” for people trying to enter. This new war is couched as a war against human traffickers, but it includes no measures to protect the migrants in whose name they are hypocritically acting, and leaves untouched the policies of economic genocide and permanent warfare which are driving people into the hands of the murderous human traffickers in the first place. The first phase is to collect intelligence on the smuggling routes from Libya to southern Italy and Malta; the second, for EU ships to start chasing and boarding smugglers’ boats; and third, to take military action to sink the boats in Libyan territorial waters, perhaps then blame the Libyans for allowing the refugees to drown in its territorial waters. The ministers, so far, say they will seek a UN resolution such an action, before taking it. Using the familiar, stock phrase for such illegal wars, the EU ministers promise that there will be no EU boots on the ground in Libya. That might, after all, disturb the Islamic State militants which the last NATO/U.S./EU war against Libya brought to power, whose logistical suppliers today are the same as those smuggling people.